Here we go again with another Chest & Back Classic Volume Training Day! 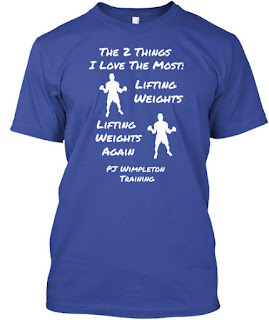 Order this shirt today at PJ's Fitness Shop! Don't go crazy with your core! You've seen it many times: Someone in the gym spends like 15 to 20 minutes on crunches, side bends, bicycles, leg raises, windshield wipers, you name it. Pick an ab exercise and they are doing it. Don't overwork yourself silly in search of a six pack. Balance is key. If you want to do 3-4 ab exercises, that's great. Make sure you balance it out with one lower back exercise for every ab exercise. Basically for every movement crunching forward, make sure you balance it out with a movement extending backward. Train The PJ Way Newsletter: Fitness Friday - CVT and Swings! Hey Hey, It's Fitness Friday! It's another ARM DAY, so let's get to curlin'! Use 65% of estimated 1RM for resistance. Alternate between exercises after a minute rest between sets. Pushdowns, rest 1 minute, Curls, rest 1 minute, etc. Grab your "My Lifting Plan" shirt here! Not up for a cardio workout today? Swings burn up to 20 calories/minute. That's about the same as doing a 400m distance at a good 5K race pace for some people. You can get a lot of work done in just 10-15 minutes of Swings, with breaks in between. 100 Swings takes roughly 2:40-50 in time. If you went every 5 minutes, you could get 400 done in 20 minutes of time. If you're not used to Swings, try for sets of 40 to 50, alternating arms every 5 or 10 reps. For example, if you're doing sets of 50, try switching every 10 up to 40 reps, then for the last 10, switch after 5 on the last 10 reps. Going for 100? Switch arms every 10 reps.
Start with light kettlebell and basically get a heavier one once you feel that its too light for you. Even going up 5 pounds is enough of a jump. Hey Hey, It's Wimpleton Wednesday! Today's Fitness Tip: Use Fasting to your advantage. Today is the start of Lent. Fasting from meals or certain foods on certain days is a practice used during Lent for some faiths, especially Catholics. Ash Wednesday and Friday's during Lent are days to abstain from eating meat, for instance. Many will end up giving up certain foods during this time, such as junk foods, to fast from that in their life. You can use this practice in your own life to work on cutting a bad eating habit out of your pattern of habits. Maybe you drink too much pop per day, so work on reducing that. If you can't totally give it up, at least greatly reduce it, such as going from 3-4 per day down to 1. It's good to take some short periods of time to work on cleaning up your diet anyway, because not everyone is perfect and will slip up on their dieting. Fasting is a good, brief thing to help you focus on something that can get you on track. Today, we'll discuss AMN, American Made Nutrition. I've sold other supplements in the past, but didn't really care for their structure in how they were sold. Too many different prices, for the same thing, depending on how many you ended up selling. AMN is different. The price is steady and the commissions are the same. I like it because I don't have a silly 'business opportunity' to sell. If you wanted to sell them online like I do, you'll sell them the same way I do. No goofy 'business package'. Your affiliate link is setup and you simply share it on your blog, website, or postings. Some products are very affordable, while others are stacks of multiple supplements. 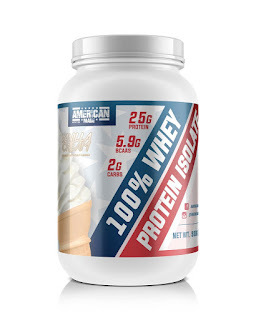 Everything from protein powders to creatine to weight loss stacks and pre-workout drinks, there is something for everyone, from the newbie to the veteran. Take a look here at AMN and see what you think! Disclaimer: I do earn commissions off sales provided by this link. The progression goes from week to week, instead of workout to workout. The varied intensities usually go from high, to medium, and to lighter. Next week on Monday, you'd look at progressing in your sets of 5 x 3. Wednesday, progress in your sets of 5 x 6-8. Friday's focus is improving upon your sets of 3 x 12. Some like this change throughout the week as it offers instant variety within the week. Some trainers prefer this method because it trains people at multiple intensities and aids in recovery. Some call this the HML, or Heavy, Medium, and Light plan. Others take it a step further and go heavy one week, medium the next, and light the third. It's ARM DAY, so let's get to curlin'! Show people what you REALLY LOVE this Valentine's Day. 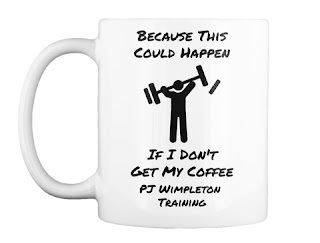 Order a sweet workout shirt from PJ's Fitness Shop! Friday's Fitness Tip: Try a Fast. If you want to try to lose a few pounds, an evening fast is a great thing to try. Simply don't eat a bunch of snacks in the evening after your last meal. Try drinking a lot of water to keep you 'full' and also assist you with a bit of a cleanse. Some people even try a 24 hour fast now and then, but that doesn't work for everyone. Just wait to eat something until morning. 9 Swings, 9 Leg Raises, 8, 8, 7, 7, etc. down to 1. Today's Fitness Tip: The popular HS and college athlete program, Bigger, Faster, Stronger (BFS) isn't too bad of a program to follow if you're looking for a basic, quick routine. Their In-Season plan might be ideal for those who are short on time, but still want to make some progress. Week 1: 3 x 3 (easy) - Go somewhat easy on these sets, its a lighter week. A good guide? Your weight for sets of heavy 5 reps, do 3 of them instead with those 4 to 5 rep weights. Week 2: 3 x 5 (medium) - much like 5x5 routines, progressively build into a hard set of 5 at the end. Week 3: 5-3-1 (hard) - build up to some heavy sets here. Week 4: 10-8-6, 4-4-2 - Use 4-4-2 on lifts like DL's and Power Cleans, 10-8-6 on others. After 4 weeks, return to Week 1. Some good pairings are: Squats, Bench Press, Deadlifts, Power or Hang Cleans for these heavier sets. 2-3 sets of 8-10 on auxiliary lifts like Lat Pulldowns, shoulder presses, and ab/core exercises are suggested. My suggested pairings: DL and Power Cleans, then Bench Press and 1-Arm Rows. DL, rest 2 minutes, PC, rest 2 minutes, repeat until done. BP, rest 2 minutes, 1 Arm Rows, rest 2 minutes, repeat until done. Speaking of Curls, here is today's workout! We're only 12 days away from Valentines Day. Classic workouts are classic for reason: They've stuck around because of their simple ability to be productive workouts. Others have tested them before you and have applied them to others. Workouts like the 5x5 plan have stuck around for decades because of the simple ability to apply them to compound exercises and eliminate confusion. Try not to get caught up in workouts that have 10-12 different exercises per workout day. Its a lot to learn and the only confusion happening is not to your muscles, but to your brain. It's like doing algebra in first grade. First graders don't do algebra, they do simple addition and subtraction. They get those basics honed down first and progressively are able to do harder math equations. Same goes with training the human body. Don't start trying to be like Albert Einstein to solve E=mc2. Just get your addition flashcards down and make sure you got those skills down first. Focus on 3-4, maybe 5 compound exercises in a workout and nail them down. You don't have to do 14 variations of chest exercises. Keep this stuff simple, folks.